I came out as bisexual ages ago. My parents are really cool with it, my friends seem close to bored whenever I mention my sexuality. I guess I’m in a lucky bubble of happiness and acceptance. But, if that is the case, why did I feel nauseous when offering to write an article on the subject? Here’s the thing: bisexual people are in a difficult position. We’re often considered too close to heterosexuality to be taken seriously by the LGBTQ+ community (don’t let the initials fool you), but identifying as straight would be lying. This leaves us in an area that, although existent, is often not acknowledged and we’re forced to pick a side. A friend from school bumped into some ex-school mates a few months back. “How’s Natàlia doing?”, they asked. My friend explained that I was doing fine and had a boyfriend, to which they replied: “Oh, so she’s not a lesbian anymore?”. To put it simply, because it is a simple concept, bisexuality doesn’t work like a light switch. We don’t go back and forth between being straight and being gay. We’re more like light regulators, at times preferring one side to the other, but never switching off. No matter how happy I am now in my circle of accepting family and friends, it hurts to think that some people don’t even believe this grey area exists. Speaking of jokey statements, let’s talk about the two classics: “Oh, you’re bi? You must be into threesomes!” and “Bisexuals are not to be trusted, they can leave you for anyone”. People who believe in bisexuality plus all its stereotypes are as problematic as those who don’t believe in it at all. The issue is that they are commenting on an orientation that is yet to define itself as a community. In my opinion, this lack of communal support leads us to rely more on exterior comments to describe ourselves. For years I thought that because I was bisexual I had to be into threesomes, open-relationships and promiscuity, only because others were telling me so. At least these comments were giving me a (very erratic) description of what I was. Other people choose to not even identify as bisexual due to the lack of a supporting community. This Saturday, I spoke to an older bisexual man who in the past had come out as gay. He knew he was bisexual all along but appreciated the almost familial feeling of belonging to the well-established gay community. I understood what he meant. All the gay pubs, the well-known lingo, the literature, etc. that evolve around homosexuality are ideal. If your own community isn’t defined enough for you to describe yourself in it, why not join another one? The sense of feeling included is often more powerful that being true to yourself. 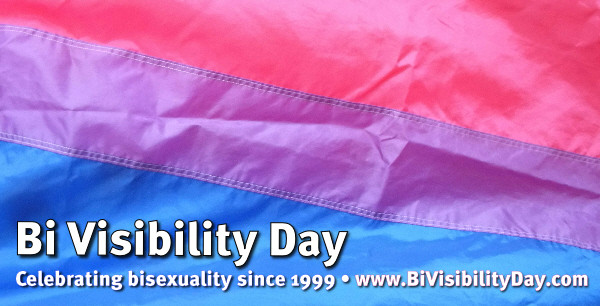 I am celebrating Bi Visibility Day because although I’m in a lucky bubble, there’s still a lot to do outside of it. We are yet to grow as a group. We are yet to mark our presence as a grey area that is not gay, not straight, but definitely existent. If we are to be included in the LGBTQ+ community we should be given the space to grow in our own terms. That is, without relying on external remarks to construct our identity nor having to be adopted by other communities to feel like we belong somewhere.